Airgeddon is very powerful tool, designed to perform a wide range of effective attacks against wireless Access Points, i.e. Wi-Fi networks. Airgeddon automates using different tools, so it is not necessary for you type commands. Airgeddon usage does not require deep understanding Wi-Fi protocols or performed attacks. Therefore, absolute beginners are able to hack (audit) wireless networks. There are some different protocols and cyphers using by Wi-Fi networks. So some different attack vectors exist. Some of the Wi-Fi protocols and cyphers are really weak. Airgeddon helps us to use different techniques. And strategy to reveal the weakest link in the chain let us to increase chances of success and do decrease the time of hacking. 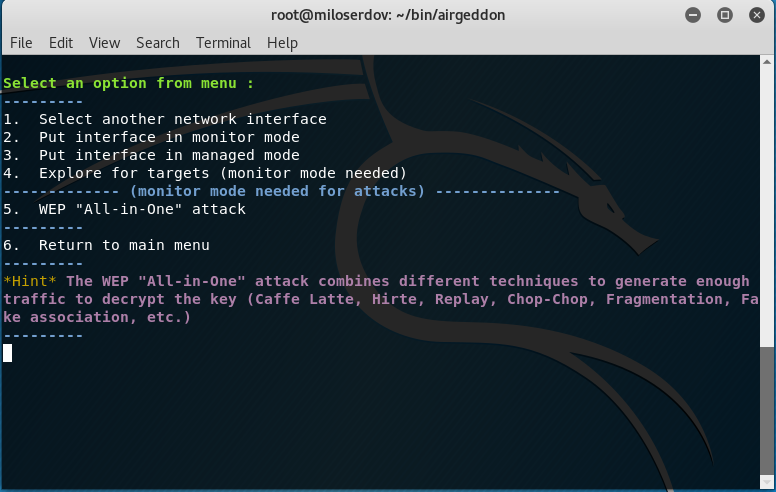 This is the first part of manual, explaining how to use airgeddon to hack Wi-Fi. In this guide, I will use only free and open source programs. They run in Linux operating system. Actually, you can use any Linux distribution, but you will save a lot of time if you select some special penetration testing distribution. I operate in Kali Linux. It contains all necessary tools for airgeddon. You may install Kali Linux as the second operating system on your physical computer or you may set it as virtual machine (for example, using VirtualBox). Both ways are acceptable. There are no special requirements to your computer. If it is able to run Linux, it suits. But there are requirements to your wireless adapter. I will not be stuck on ‘monitor mode’, ‘wireless injection’, and ‘drivers for Linux’. In sum, any Kali Linux Compatible USB Wi-Fi adapter from the list will suit the needs. But there is an issue with attacks against WPS. So indeed I recommend you to have two adapters from the above list. The first one is Alfa AWUS052NH or Panda Wireless PAU09 N600 . Both of them are Dual Band, operate on 2.4GHz and 5GHz Frequencies, have two large 5dBi antennas to improve the signal. Any of them are great choice for almost all wireless attacks. However, they will fail attacking WPS. For a brute force attack against Wi-Fi Protected Setup (WPS) registrar PINs in order to recover WPA/WPA2 passphrases, Alfa AWUS036NHA is highly recommended. 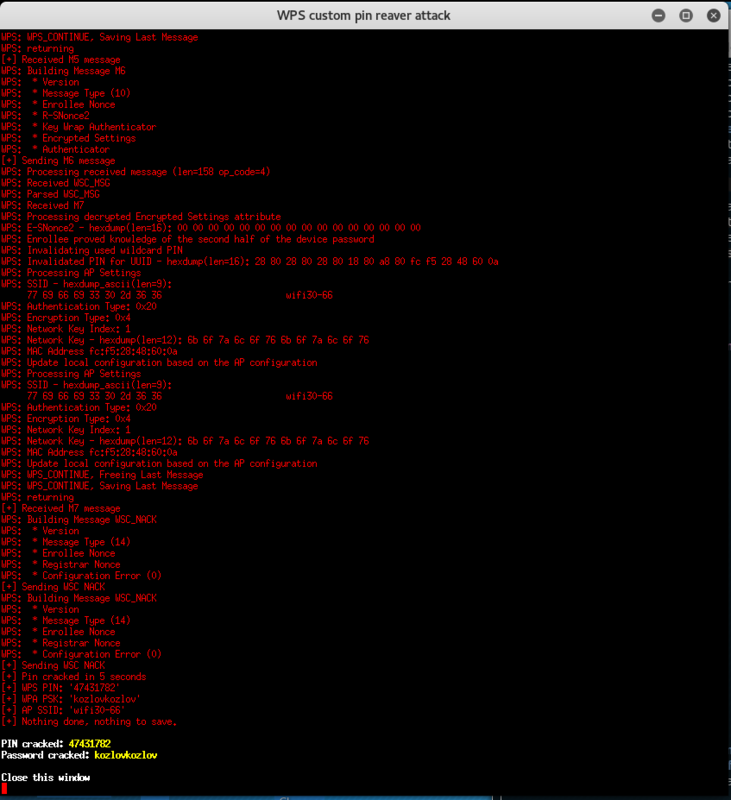 Ok, now we have a dictionary to hack Wi-Fi password, it is the /root/newrockyou.txt file. Plug your wireless USB adapter (if it is unplugged). Now we are armed completely. We are able to hack our first Wi-Fi network. As I mentioned above, there are some different protocols and cyphers using by Wi-Fi networks. The weakest one is WEP. The WEP protocol had a bad design and can be cracked in a few minutes if we have enough generated traffic. So we should start from checking whether any WEP enabled networks is available around us. 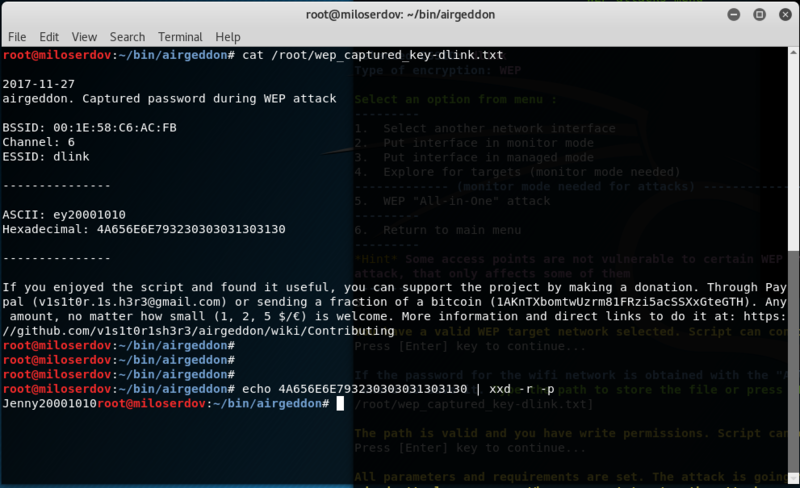 The WEP "All-in-One" attack combines different techniques to generate enough traffic to decrypt the key (Caffe Latte, Hirte, Replay, Chop-Chop, Fragmentation, Fake association, etc. Many WPS enabled Wi-Fi Access Points is vulnerable to WPS attacks. 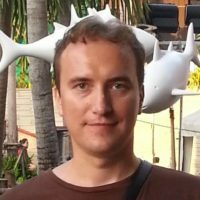 Currently there are known issues with the devices that uses rt2800usb drivers (chips RT3070, RT3272, RT3570, RT3572 etc). There is unfortunately right now no solution. Therefore, the great Alfa AWUS052NH and Panda Wireless PAU09 N600 do not suit for these attacks. For all WPS attacks, I highly recommend to use Alfa AWUS036NHA . Because it is based on another chipset and uses another driver. 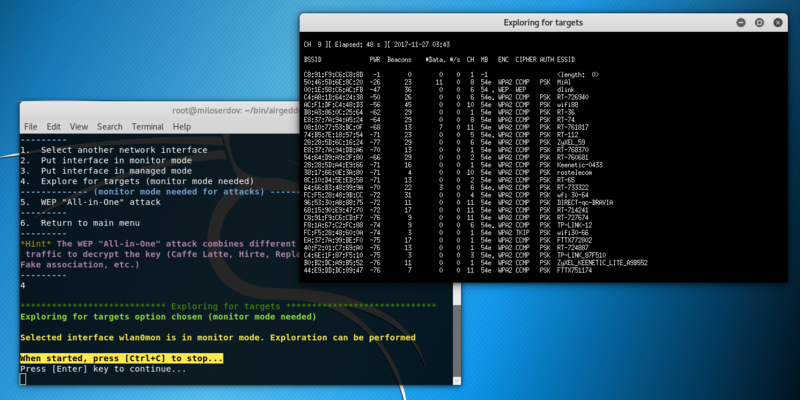 WPS PIN exploiting the low or non-existing entropy of some Access Points, the so-called "pixie-dust attack" discovered by Dominique Bongard in summer 2014. As opposed to the traditional online brute-force attack, implemented in tools like Reaver or Bully which aim to recover the pin in a few hours, this method can get the PIN in only a matter of milliseconds to minutes, depending on the target, if vulnerable. Next select ‘8. (reaver) Pixie Dust attack’. Select Pixie Dust timeout 100 or more seconds. The attack described in details in ‘Effective WPS PINs attack based on known PIN and PIN generation algorithms’. This attack requires hours or days to get WPS PIN. Use the attack if previous ones failed. 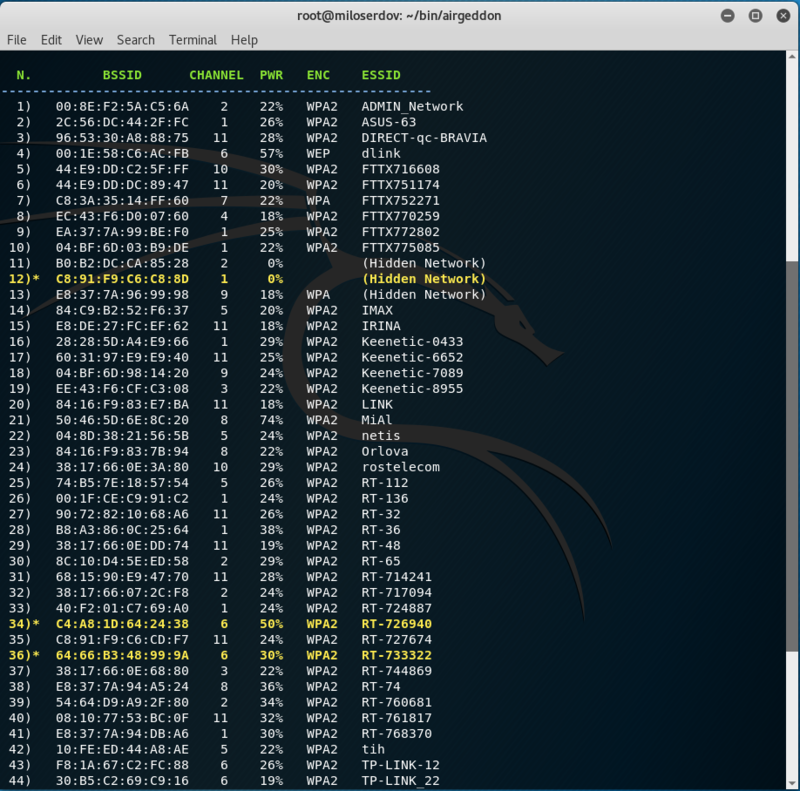 This attack lets you reveal WPA-PSK password of Wi-Fi network if you know WPS PIN. 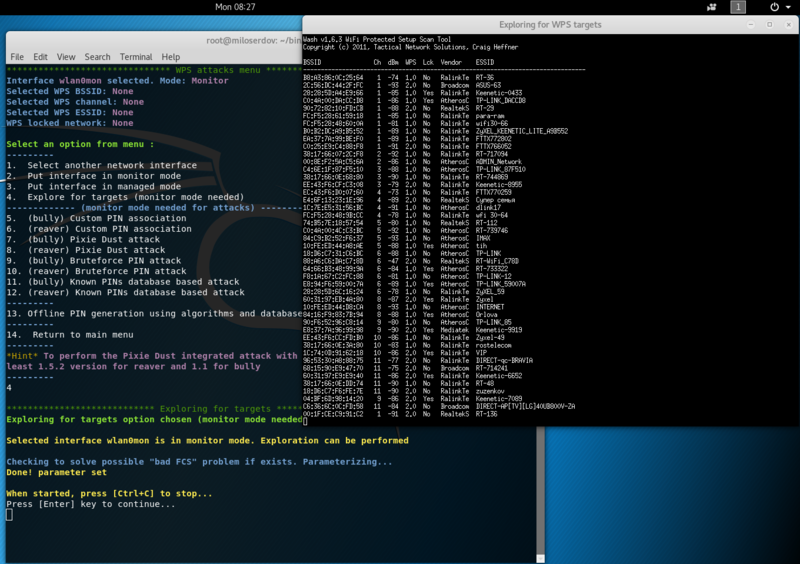 If target Access Point is not WPS enabled or if all WPS attacked failed, we can try to capture Handshake (frames by which the Access Point and Station are exchanged during connection) and decrypt it. For all the following attacks I will use Alfa AWUS052NH . Usually I prefer the second option (Deauth aireplay attack), if it failed I try with ‘1. Deauth / disassoc amok mdk3 attack’. Two windows will be opened. One with the Handshake capturer and other with the attack to force clients to reconnect. Don't close any window manually, script will do when needed. In about 20 seconds maximum you'll know if you've got the Handshake. To launch Dictionary attack against capture file I select the first menu item (‘1. 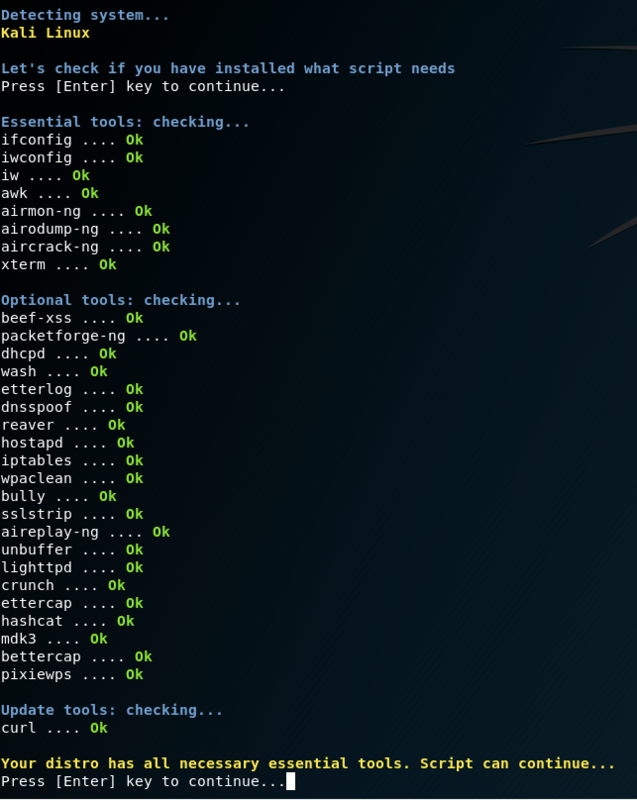 (aircrack) Dictionary attack against capture file’). As the path of a dictionary file I enter /root/newrockyou.txt. If the attack succeeded the string, containing ‘KEY FOUND!’, will be displayed. If the dictionary attack failed, you can try again with another dictionary of use the ‘2. 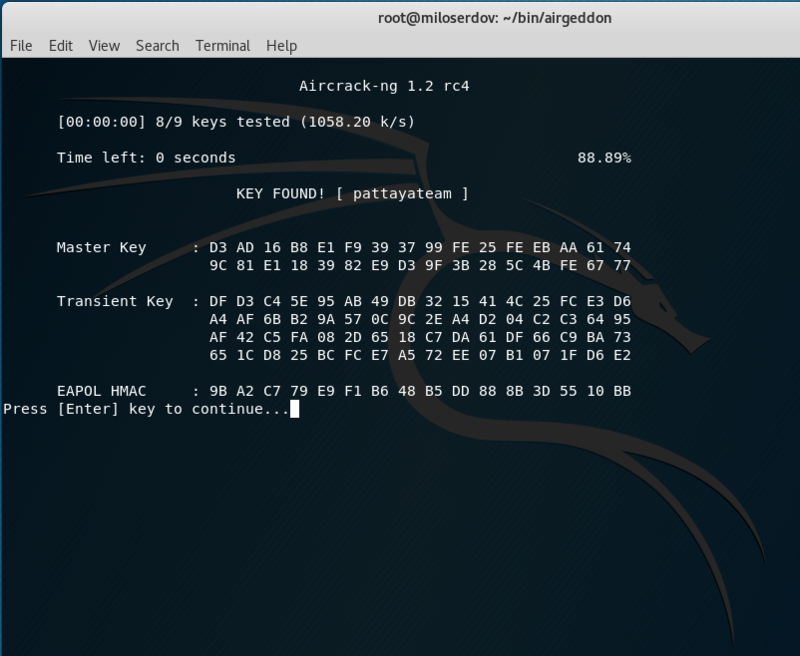 (aircrack + crunch) Bruteforce attack against capture file’. I recommend you to try eight digits and ten digits passwords (Numeric chars). The first ones are Birthday dates (19990210); the second ones are phone numbers (09341112233). In this part, we discussed the essential Wi-Fi attacks, which, nevertheless, are commonly used for wireless network audits, for hacking Wi-Fi. 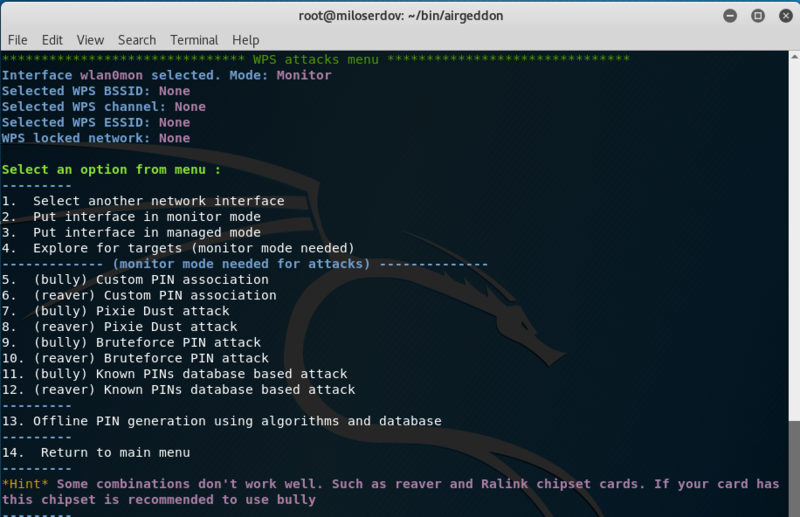 In the next part we will continue to learn airgeddon usage and we will review Evil Twin attack (Captive portal with "DNS blackhole" to capture wifi passwords), Rogue AP (aimed to sniffing) and DoS over wireless networks using different methods. Also, pay attention to ‘All Airgeddon Hints’, which will help you to understand the wireless attacks better. i follow your automated wep attack. but i got this error"the selected network is invalid encryption type of target network must be wep"
I suppose you select a network with WPA encryption, for WEP attack you should select a network with WEP encryption. For networks with WPA encryption use handshake capture based attack or WPS PIN brute-force. hey alex! i found your article very helpful for begginers like me. i've installed airgeddon successfuly. Thanks to you! and i was wondering if i could use airgeddon without wifi adapter to hack wifi. is it possible? btw im using lubuntu. Hello! If you mean wireless hacking you need a Wi-Fi adapter certainly. 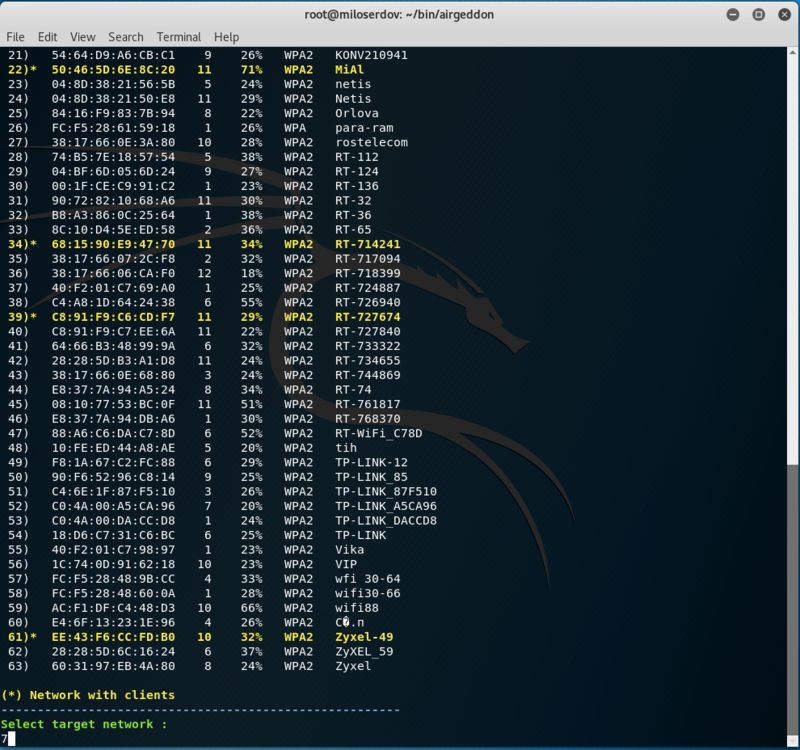 There are options to hack routers via wire using Router Scan or RouterSploit. BUT: for the attacks you need to know IP of a target router – usually it is not a simple task. okay! but what about if i somehow, manage to get the ip address of router. how could i crack the password? First, please, no personal e-mails and personal messages. Thank you! You may ask any questions here, in the comment section. 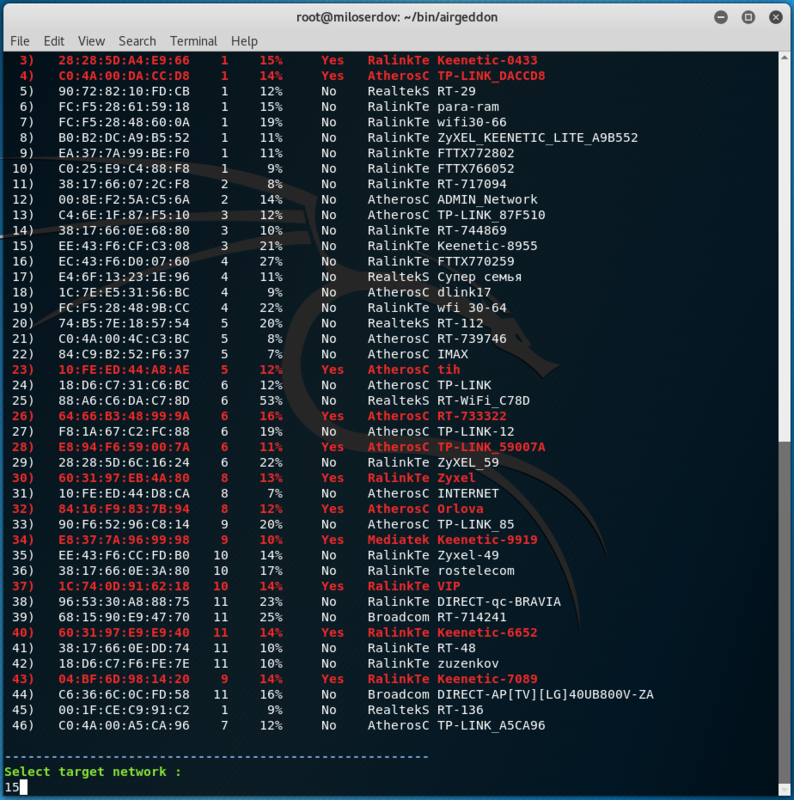 If one got the IP of a target router, sometimes it is possible to hack a router using vulnerabilities or guessing admin’s username and password (brut-forcing credentials). And then when one got access to the router’s admin page, one is able just see Wi-Fi password and other information. okey, no personal messages! got it!! anyways, thanks for your information. i'm on linux mint with all the components installed except for bettercap, which gave me a few problems. as a network interface i'm using an alfa network AWUS036NHA with an Atheros AR9271 chipset. do you know what might be causing the problem? what does this offer in comparison to Wifite?